Theatre Access Nyc: Breaking Barriers to Broadway! 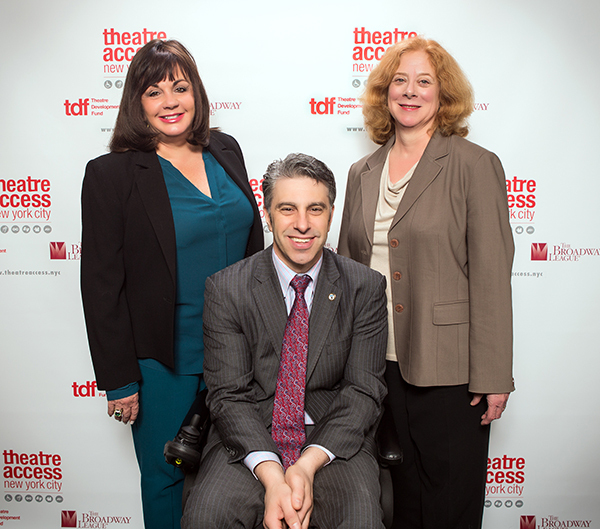 March 21, 2016 New York, NY – Theatre Development Fund and The Broadway League are Breaking Barriers to Broadway with the launch of Theatre Access NYC, www.theatreaccess.nyc, a new website designed to assist theatregoers with disabilities in finding accessible performances of Broadway productions. This website is a way to help theatregoers with physical disabilities or autism and other sensory sensitivities find Broadway shows with the particular type of accessibility service they require. Theatre Access NYC is an intuitive, user-friendly show finder that allows users to filter and sort through dozens of Broadway shows based on accessibility, and provides details including dates, times and ticket availability for accessible performances. “We are pleased to be part of Theatre Access NYC, in collaboration with Theatre Development Fund, which will bring more people with disabilities to Broadway. 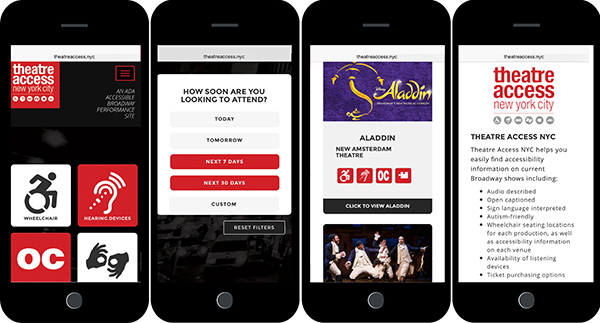 Our goal for the new website is to provide all theatregoers who want to experience our shows an easy-to-navigate place where they can find extensive information in one location,” saidCharlotte St. Martin, President of the Broadway League. We want everyone who visits the Theatre Access website to feel welcome and find the experience rewarding. To help us make the Theatre Access website a positive place for everyone, we’ve been using the Web Content Accessibility Guidelines (WCAG) 2.0. These guidelines explain how to make web content more accessible for people with disabilities, and user friendly for everyone. The guidelines have three levels of accessibility (A, AA and AAA). We’ve chosen Level AA as the target for the Theatre Access website. Improvements and fine-tuning will continue as users help us make the site as user- friendly as possible. THEATRE DEVELOPMENT FUND (TDF) was created in the conviction that the live theatrical arts afford a unique expression of the human condition that must be sustained and nurtured. It is dedicated to developing diverse audiences for live theatre and dance, and strengthening the performing arts community in New York City. Since 1968, TDF’s programs have provided over 90 million people with access to performances at affordable prices and have returned over $2.5 billion to thousands of productions. Best known for its TKTS Discount Booths, TDF’s membership, outreach, access (including its internationally renowned Autism Theatre Initiative) and award-winning education programs — as well as its Costume Collection — have introduced thousands of people to the theatre and helped make the unique experience of theatre available to everyone, including students and people with disabilities. Recent TDF honors include a 2011 Mayor’s Award for Arts and Culture, a 2012 Tony Honor for Excellence for its Open Doors Arts Education Program, a 2012 New York Innovative Theatre Award for its support of the off-Off Broadway community, and a 2013 Lortel Award “Outstanding Body of Work Award.” For more information about TDF, go to: www.tdf.org. THE BROADWAY LEAGUE (Charlotte St. Martin, President), founded in 1930, is the national trade association for the Broadway industry. The League’s 700-plus members include theatre owners and operators, producers, presenters, and general managers who present in nearly 200 markets in North America. Each year, League members bring Broadway to nearly 30 million people in New York and on tour across the U.S. and Canada. The Broadway League annually co-presents the Antoinette Perry “Tony” Awards®, one of the most coveted awards in the entertainment industry. Key League programs and resources include: Kids’ Night on Broadway®, The National High School Musical Theatre Awards (The Jimmys), Stars in the Alley®, Internet Broadway Database® (ibdb.com ), Broadway.org,SpotlightonBroadway.com, Commercial Theater Institute (with Theatre Development Fund), as well as numerous conferences and forums for our members. TheatreAccess.nyc (co-produced with TDF) is the one-stop website of accessible Broadway performances for theatregoers with disabilities. Broadway.org is the League’s official on-line headquarters for Broadway in NYC, on tour, and internationally. For more information visit BroadwayLeague.com, or follow The Broadway League on Twitter @TheBwayLeague and on Facebook at Facebook.com/BroadwayLeague. Download the free Broadway.org and IBDB mobile apps from the iTunes App Store or Google Play.